Airfloat Systems (“Airfloat”or the “Company”), a division of DemirCo (“DemirCo”) Industries LLC, designs and manufactures standard and custom material handling equipment that utilizes advanced load movement methodologies and air film technology. Airfloat produces air bearings, air skids, turntables and other material handling equipment for the automotive, water processing, aerospace and other industries. The credit facility under which Airfloat operated was cross-collateralized by the assets of several co-borrowers on a joint and group basis. Due to losses attributed to one of the co-borrowers, the loan agreement was deemed to be in default. SSG was engaged to explore strategic alternatives for DemirCo, its divisions and affiliates, including a full or partial sale or a restructuring. 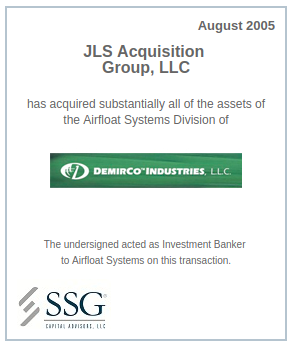 SSG assisted DemirCo in the sale of Airfloat’s assets to JLS Acquisition Group, LLC. The transaction closed in August, 2005.